Team Trust Canvas – "In Team We Trust"
After a series of exercises and brainstorming sessions with various teams, we have clustered the most frequently occurring factors that positively influence Trust in teams (and from different sources too, for ex. “The Trust Edge” David Horsager). The main purpose of this tool is to build a discussion around the trust and possibly generate new rules or agreements in a team. It is extremely useful for defining, designing, and monitoring team trust. 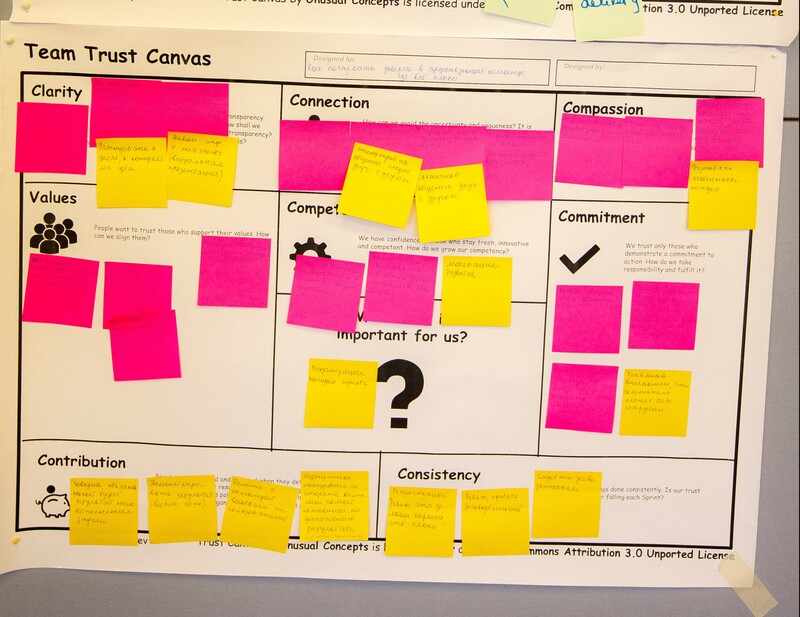 IN BRAZILIAN PORTUGUESE Team Trust Canvas translated by Leandro Pilatti. IN DUTCH Team Trust Canvas translated by Ron Eringa and Stephan van Rooden.